POZ magazine founder, fellow anti-criminalisation advocate – and friend – Sean Strub, recently joined forces with the incredible Catherine Hanssens and her amazing team at the Centre for HIV Law & Policy to launch the Positive Justice Project. In his latest blog post at POZ.com, Criminalization 101, he explains why the criminalisation of non-disclosure, exposure and non-intentional transmission has become one of the most pressing issues of our time. I'm including his introduction here. Read the entire post at POZ.com. 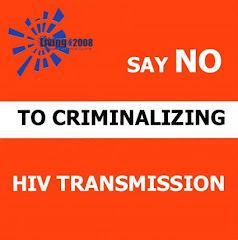 Over the last several years, as I've talked to a wider circle of advocates, people with HIV and policy leaders about HIV criminalization, it has become apparent to me that many people are not well-informed on the topic. Some instinctively favor prosecuting people with HIV for not disclosing their HIV status prior to intimate contact, but these opinions usually evolve quickly as a person learns more about the issue. Here's a background piece I have been using--and continuing to modify--to introduce the issue to others. It is a bit lengthy for a blog post. If you would like a footnoted and properly formatted version emailed to you, just shoot me a note at sstrub (at) hivlawanndpolicy.org. I look forward to any comments or suggestions.